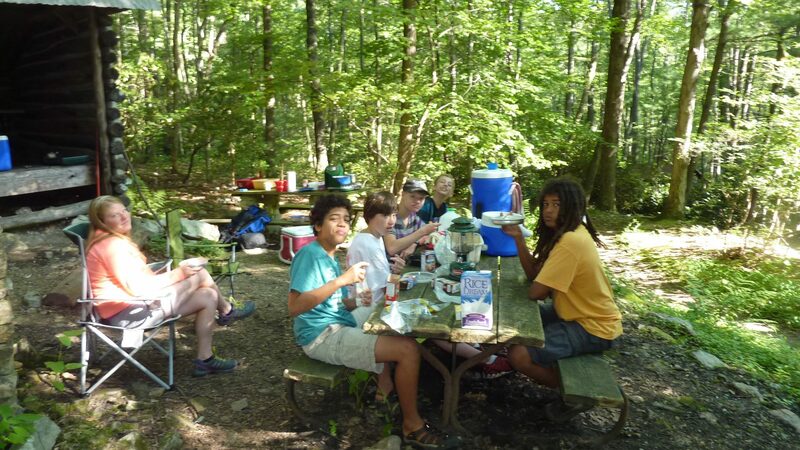 In August, five intrepid boys joined intern AmandaWerner and I for a week of camping, conservation, and science at Hawk Mountain Sanctuary for the Summer at Hawk Mountain camp. 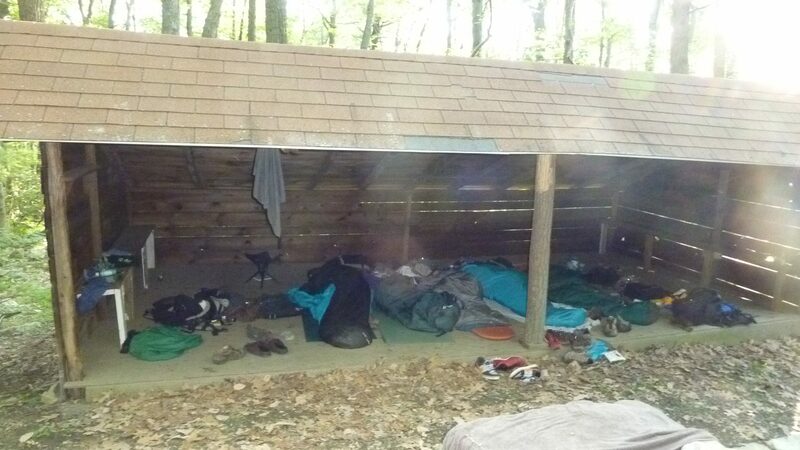 We arrived and set up camp at one of their Adirondack Shelters, our home for 3 days and nights. 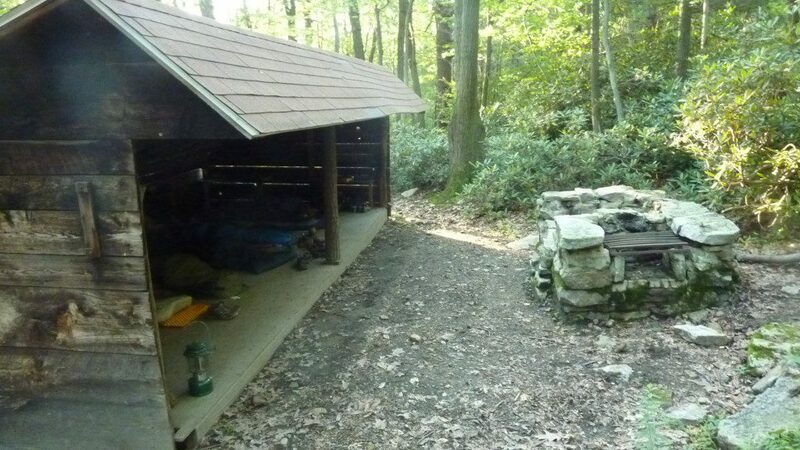 Our Adirondack Shelter at Hawk Mountain. We met Dr. Goodrich, one of the biologists at Hawk Mountain, on our first afternoon, and learned of the international raptor research taking place. 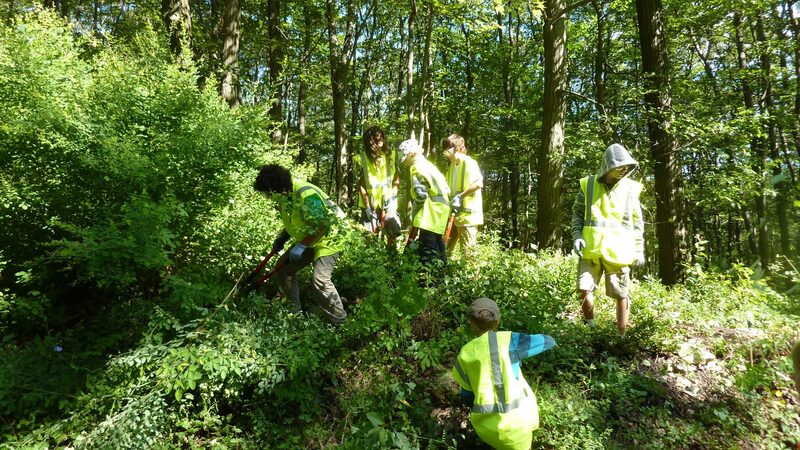 Wednesday was devoted to our ‘service learning’ project – in other words, doing some grounds maintenance to pay for our week. Cutting back road vegetation to comply with county requirements was our job, and the boys grabbed the clippers and chopped and bagged for the morning. A trip to the river for a swim was the afternoon refresher. We swam in the Little Schuylkill River. Thursday was the first day of the Hawk Mountain Fall Migration count, and we were there, helping to see the first raptors traveling south along the Kittatinny Ridge. We watched the skies for migrant raptors on the first day of the fall migration count. 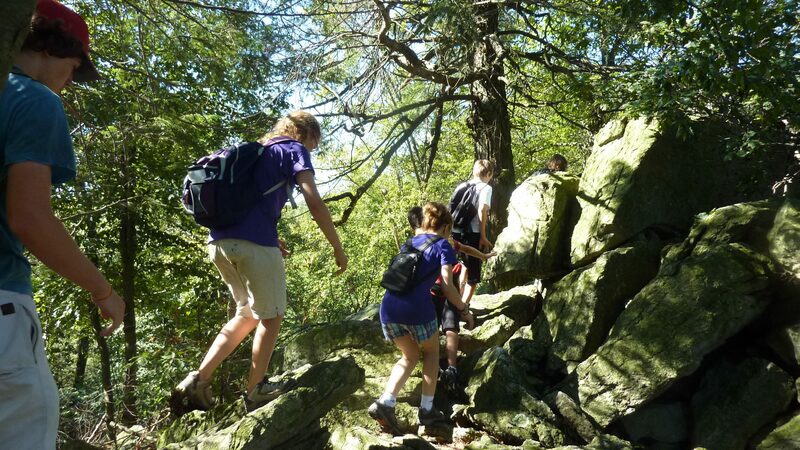 We then hiked one of the most challenging trails, tackling boulders along the ridge-top and then downhill to the River of Rocks. We found it was a super snake finding day, and we spotted 3 different species along the trail. 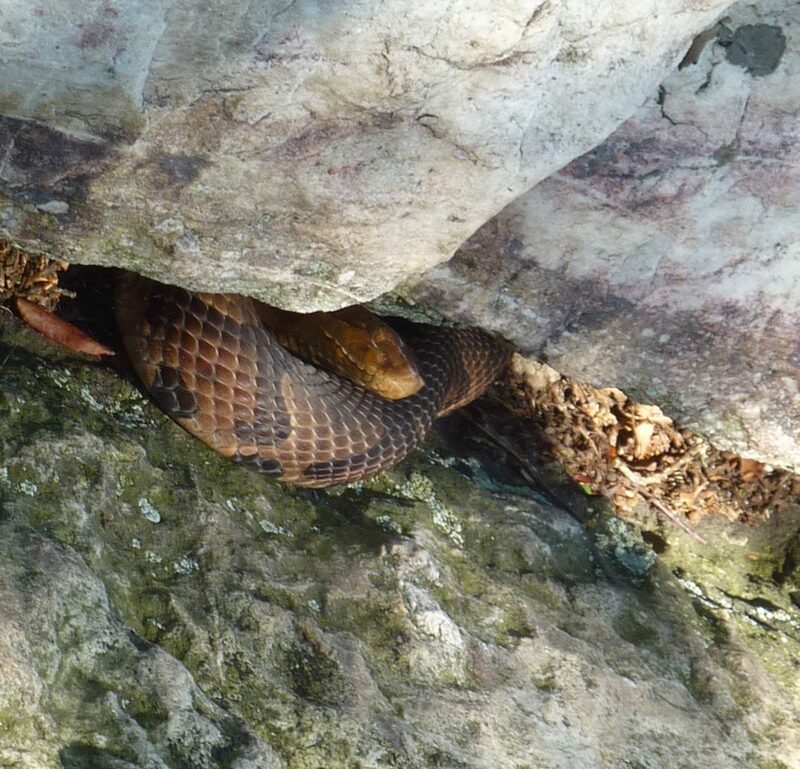 Here is the Copperhead we found, the first one documented at Hawk Mountain for many years. We found a copperhead on the trail, the first documented at Hawk Mountain in years. After that ‘athletic day’, everyone slept well. We were exhausted and slept-in after all the activities! And after campfire breakfast of leftover chile and black beans, we cleaned our site and headed back to Ashland. Here we enjoyed a late, leisurely breakfast. 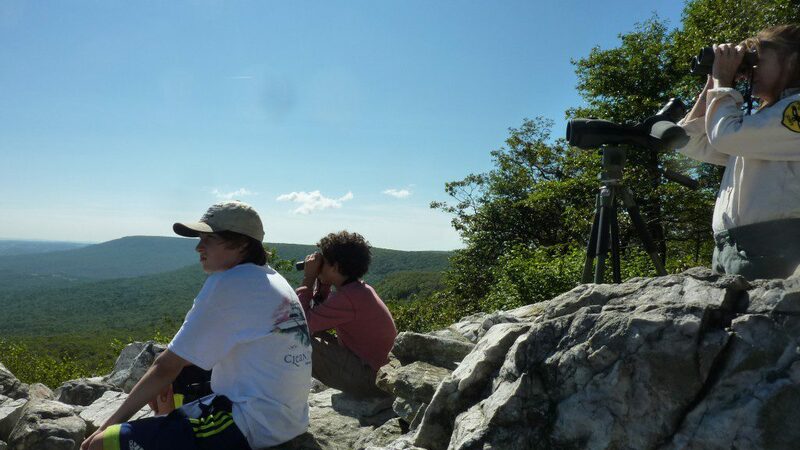 I hope to see some enthusiastic Raptor counters and campers next year for another Summer at Hawk Mountain trip! 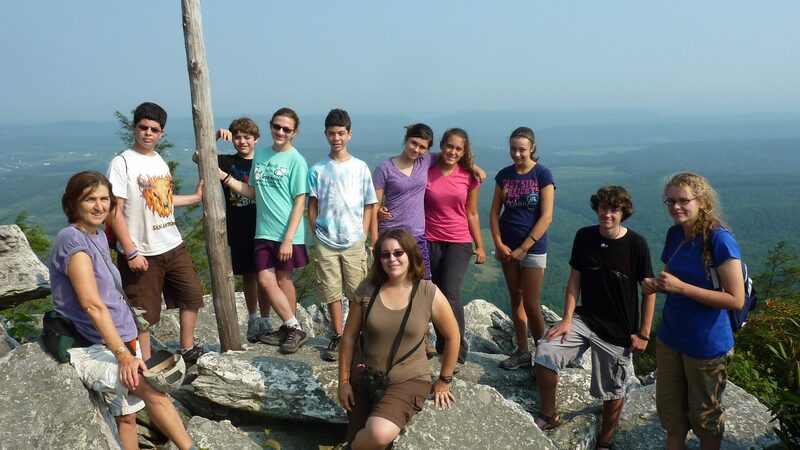 In the last week of the DNS summer camp calendar, I took a group of kids, aged 11-15 to Hawk Mountain Sanctuary, on the Kittatinny Ridge of the Appalachians. It was the first week of their fall raptor migration count, so we hiked to the North Lookout to look for migrating birds, met some of the resident raptors used for education, and helped in a major conservation activity – building an erosion control check on a trail. We also met with Keith Bildstein the Sarkis Acopian Director of Conservation Science, who was just back from the Falkland Islands where he studied the Striated Caracara, and we were treated to a personal presentation of this ‘cutting edge’ research. Here we are on our hike to the North Lookout. 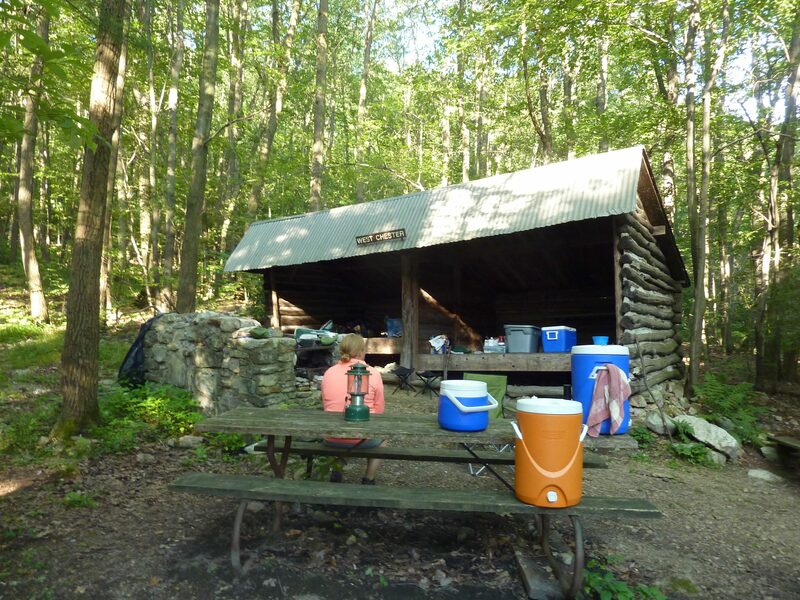 We stayed in Adirondack Shelters for three nights and cooked our meals at a stone fireplace. All water was hauled to the site – with the rocky soil on the path, we appreciated the need to repair the trail. Here is the Adirondack Shelter where we made camp at Hawk Mountain Sanctuary. On the last morning, we took a different trail to the North Lookout where we found historic shotgun shell remnants from the days that raptors were shot by the hundreds from the mountaintop. When we got to the top in early morning, we were greeted by a juvenile turkey vulture – a fitting end to a great week. 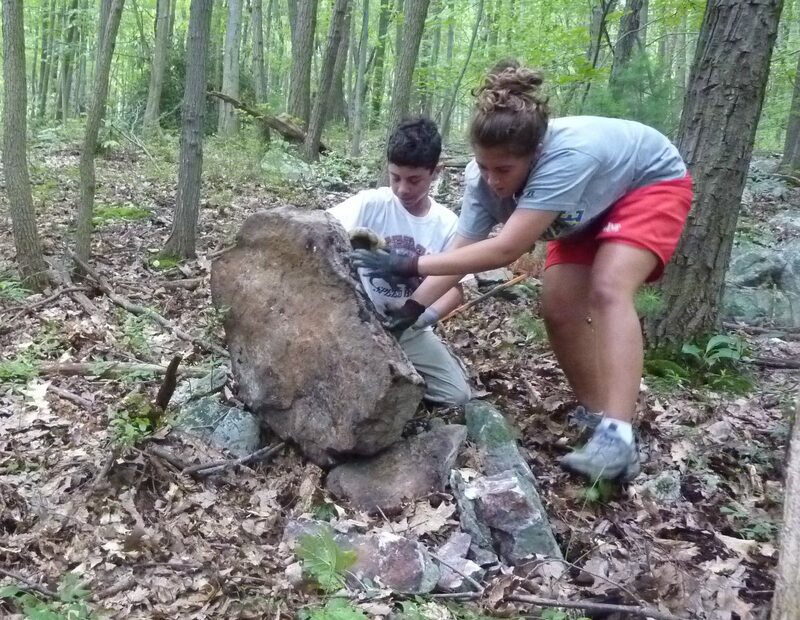 Here we are working on rebuiding a trail for Hawk Mountain Sanctuary. 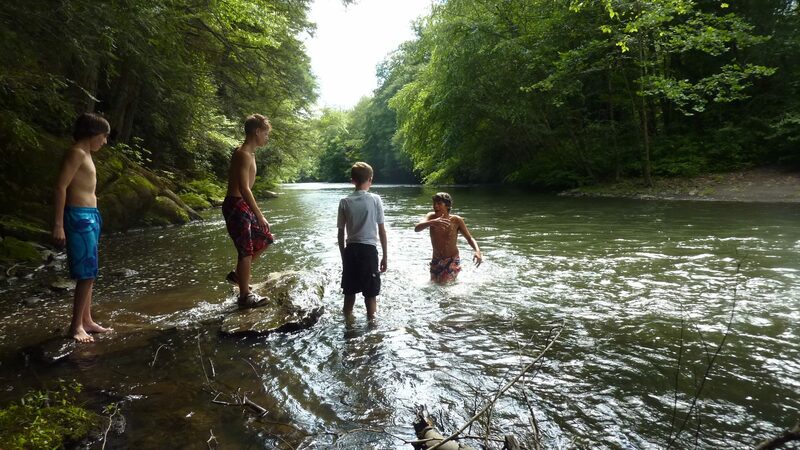 This is a popular camp for 11 to 15 year olds that fills up every year. Keep this one in mind if you know a child of this age who might enjoy this kind of experience next year. At the end of the week, we had observed lots of raptors, talked with scientists, enjoyed camping on the mountain, and contributed to the organization through a conservation project. Several of our campers this year were repeats from last year.